Video assistant referee technology (VAR) will make its debut at the World Cup in Russia this summer despite lingering opposition from within and outside football, FIFA president Gianni Infantino said Friday. “We are going to have in 2018, for the first time, a World Cup with VAR,” said Infantino after a meeting of the FIFA Council which, as expected, rubber-stamped the go-ahead given by the rule-making International Football Association Board (IFAB) in Zurich two weeks ago. The World Cup, which takes place from June 14-July 15, will see VAR used to judge whether or not a goal has been scored, analyse whether a penalty should be awarded, decide on red cards and rectify if a player has been mistakenly sanctioned. “What we want is to help and to give the referee the possibility to have extra help when he has to make important decisions, and in a World Cup we make very important decisions,” added Infantino. “It cannot be possible that in 2018 everybody, in the stadium or at home, knows in a few seconds if the referee has made a mistake but not the referee himself — not because he doesn’t want to know about it but because we forbid him to know. VAR has been trialled since 2016 by 20 federations, including the German Bundesliga and Italian Serie A, with around 1,000 matches involved. But it has not been universally welcomed with even UEFA, the European governing body, still to be convinced. “Nobody knows exactly how VAR will work. There is already a lot of confusion,” said UEFA president Aleksander Ceferin, who insists that VAR will not be used in next season’s Champions League. One of the problems that dogs VAR, say its critics, is not the accuracy of its decisions but the time it takes to arrive at them. It’s a drawback which has left many fans and purists frustrated that the flow of a game is interrupted. “The intervention of VAR takes one minute on average in each game. If we lose a minute to correct mistakes, I think we have done something good,” said Infantino earlier this week on a visit to Lima. Suarez, who led Ecuador at the 2006 World Cup in Germany and Honduras in 2014 in Brazil, remains a fan in general of the use of technology in football, which he has witnessed close up. That came in the 2014 tournament when his Honduras team played France in Porto Alegre when the first goal decided through GLT (goal-line technology) was awarded to France. “It’s good and necessary that there are changes but it’s essential that we don’t lose the essence of football,” added Suarez. Meanwhile, on Friday, the FIFA Council decided that Peru will host the 2019 Under-17 World Cup with Poland staging the Under-20 tournament. 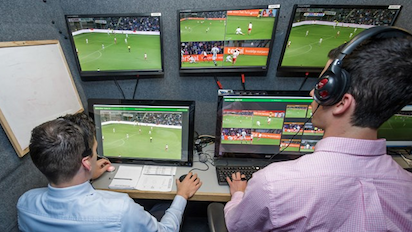 The post Transparent, fairer’: FIFA gives VAR green light for World Cup appeared first on Vanguard News.